Innsbruck’s public transport network of buses, trams and trains within the city is operated by IVB. The latest network maps in pdf format are available on IVB’s download page. Look for ‘Network map’ on the list and choose either the schematic map or the topographical map. The route map and leaflet for ‘The Sightseer’ hop on – hop off bus tour is also there. Innsbruck is the capital of Austria’s western state of Tyrol (Tirol in German). 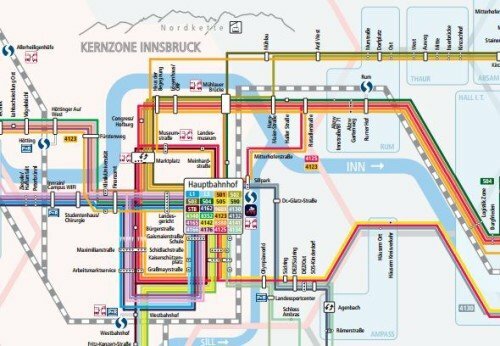 For maps of regional bus and train lines in Tyrol and local lines in places like the popular medieval town of Kitzbuhel, the region’s transport operator, VVT, provides a large number of downloadable pdf maps. Click or tap the thumbnail map below to see the list of maps. Then scroll down it to LINIENNETZPLÄNE (Network plans). These transit network plans are in schematic/diagramatic form. Alternatively, find topographic versions showing the routes on a street map under the heading VERKEHRSLINIENPLÄNE (Transport plans). Ski buses are integrated in the regular bus services. Additionally, a large number of other ski buses are run by independent operators.